It’s not a question of whether you can get real work done on an iPad. After doing so ourselves, and talking to readers who do likewise, we know that’s happening already. The real question is how to go about doing it. In this extended Macworld feature, we’ve packed in how-tos for writing, editing spreadsheets, creating presentations, and--yes--even running Microsoft Office itself on your iPad and iPad mini. We also have suggestions for how to best manage your files, access cloud services, print documents, and attend meetings from afar. And don't miss out on reading our in-depth buying guide for finding the perfect external iPad keyboard. To close out this extended feature, we have opinion pieces from Senior Writer Lex Friedman, Editorial Director Jason Snell, and Senior Editor Dan Moren. Follow Dan's three-day iPad-only journey, let Jason tell you why he loves writing on an iPad, and read about Lex's iPad writing experiences. 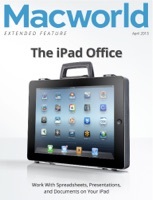 Macworld extended features are packed full with great how-tos, video, and opinion content. Check out one today and let us know what you think! Finally I get this ebook, thanks for all these The iPad Office I can get now! The iPad Office was the best books I ever buy. The iPad Office did exactly what you said it does. I will recommend you to my colleagues. The iPad Office is the most valuable books we have EVER purchased. I'd be lost without this. I am completely blown away.